Crete is a unique part of Greece, its culture, customs and traditions are often regarded as much a mystery by mainland Greeks as by tourists. To understand the island, appreciate its beauty, make the most of its hospitality and avoid the pitfalls of life there requires a guide who has gone through the process of integration and can work the system. It requires, in short, nothing less than Carol Palioudaki's The Cool Guide to Living in Crete. Pooling 18 years' of practical experience into one, accessible, interactive eBook, Carol has created the ultimate guide for the visitor, traveller, casual worker or permanent resident. No-nonsense advice, useful tips, hints and explanations dissolve barriers of culture, language and tradition and demystify life on the island of dreams. 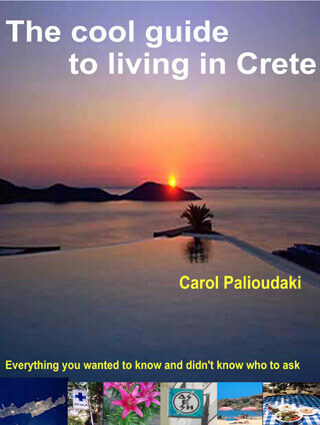 Carol's unique perspective of the culture, her very direct experience of its intricacies and her understanding of Cretan people whom she regards as her own offer insignts which nothing short of living on the island could have given the reader. Hundreds of weblinks, full-on interactivity, printable pages and maximum portability make this book as versatile as you need it to be, but it doesn't stop there. Live email addresses put you in touch with hundreds of people and organisations at the click of a pointer and embedded sound files allow youto hear the way Greek words should sound straight from the page. The result is a guide book that lives not only up to its premise but also its promise.